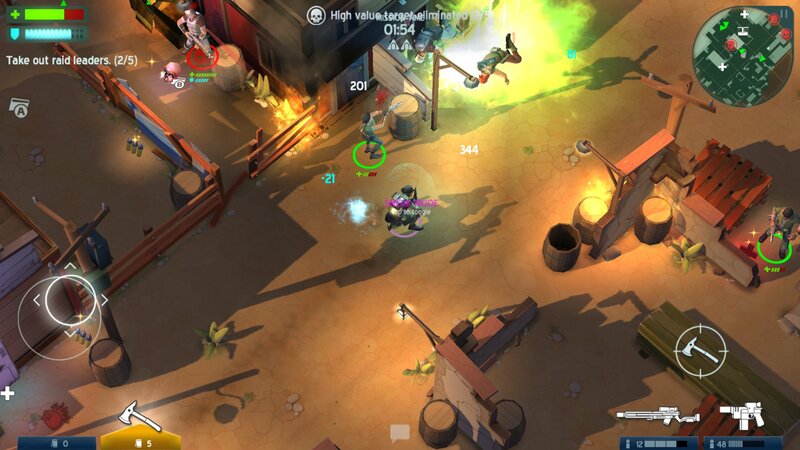 Space Marshals ($3.99) is not the dual-stick shooter you probably were expecting – at least not as a mobile game. This is a slow-burning, tactical shooter, eschewing the typical fast-paced, high-score-obsessed affairs that many dual-stick shooters try to be. Instead, this is about stealth, and using sounds to distract enemies, and trying to avoid wild firefights as much as possible. And it’s from a company known for racing games. 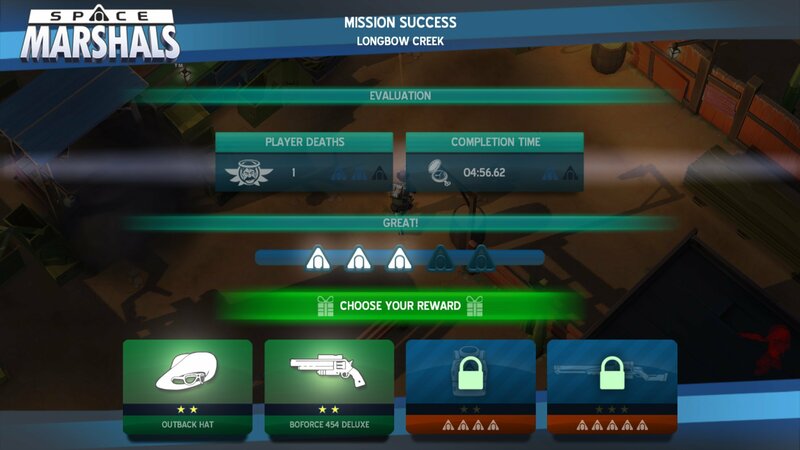 Yet, Space Marshals does a lot right, including with its reward-based loot system. This is the first episode of a series, and there’s plenty to look forward to from this game, though there’s a solid amount of game here already. You play as the eponymous space marshal, who has to hunt down escaped criminals in a futuristic wild west setting, and bring them to justice. In this case, justice means “shoot them dead" because you can’t trust fugitive space criminals who have already escaped once. The game is stealth-centric, in part because enemies can deal large amounts of damage to you, so your primary mode of operation is to switch from offensive mode to the quiet and crouching stealth mode, getting behind cover to avoid fire and to help pick off enemies before they notice you. Doing so also grants a damage bonus. You get two weapons, one smaller gun and one bigger gun such as a shotgun or distanced rifle, and two projectile weapons. There are grenades and throwing axes, but also rocks. Why go with rocks? Well, they can be used to distract enemies and get them off of your scent. The enemies are not the smartest, but they can do plenty of damage. There are plenty of health and armor pickups, ammo can be refilled often, and it’s possible to respawn from each checkpoint you reach, but you want to avoid death as much as possible in order to get better mission rewards. The missions are structured differently based on the objectives, but they generally involve some form of ‘shoot baddies’. Still, there’s ones where time is a factor, and the levels have optional objectives to discover. Plus, performance is a factor as finding the secret hints and not dying will help get you better loot rewards at the end of each mission. The game actually does do a good job at balancing out the desires of those who just want to play a game to completion, as it’s possible to respawn from checkpoints with enemies staying weakened or dead, but you get better rewards for making it through in one piece. After each mission, depending on your star rank of up to five stars, you get your pick of one loot item. The trick to this loot reward system is that the loot rewards are the same each time, so you know that if you complete a certain level with a certain degree of performance, you can get that high-level item. The downside is if you complete a level already at a high level of performance, you have to replay it to get the other items. Hats are just cosmetic, but everything else has an effect: armor, guns, projectiles. Still, it’s a system that I enjoy playing with, and it’s one that has clear rewards, instead of the randomness of most loot systems. The controls work surprisingly well. 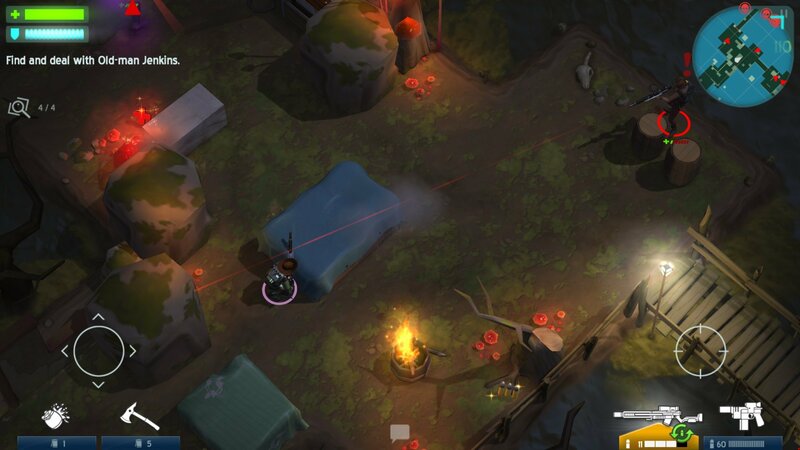 I hear about some dual-stick shooters not coming to iOS due to the inaccuracy of virtual sticks. While I don’t necessarily disbelieve that, I also think that after a while, it’s less of an issue than people think, and there’s little tweaks behind the scenes that developers can do to mitigate for touchscreen inaccuracy. 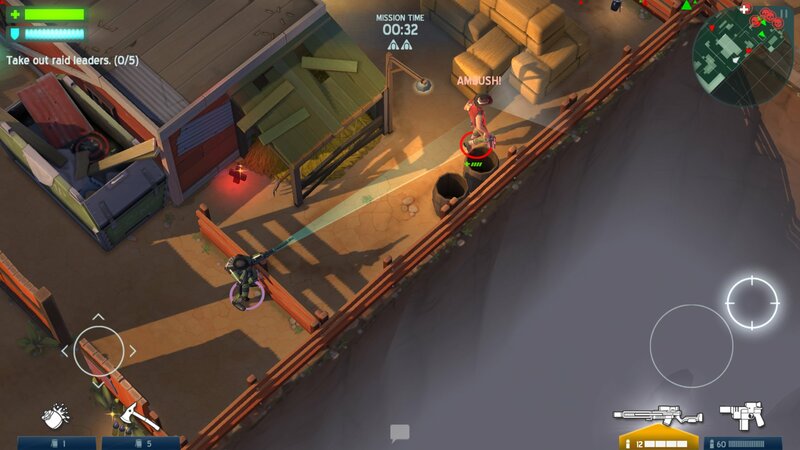 So Space Marshals sets a high bar by not being about spraying a ton of bullets in one direction, but also having rifles, grenades, and other weapons to use. There are automatic-firing weapons, but these are generally best for limited circumstances. Essentially, you drag the joystick out and an aiming line comes out. With this, you can aim at enemies, with the line spreading out to show that you’re aiming at something that can be shot. You then release to fire. If you want to cancel, you drag back in to the center and release. There’s visual feedback for this as well. Tapping anywhere outside of the sticks or weapons will change from offensive to stealth mode, and the use command is helpfully mapped to tpapping the left stick. The controls are all shockingly intuitive, and work fantastic for what this game is. Part of the reason that the controls feel so great is that the game isn’t a fast-paced game, it’s got a slower, stop-and-go pace where stealth plays a role. As such, the game discourages fast-paced gunfights because you’re going to regret them. You learn to fight from a distance and to get a jump on enemies because the controls wind up making that feel the best. I do wish this game had MFi gamepad support, and I could have sworn that it was announced to do so, but they’re not really a requirement to enjoy the game. Stealth is a huge part of the game, but the AI isn’t exactly smart – they’ll forget where you are after only a short while. Space Marshals has fantastic iCloud support, which is sadly still a feature that requires commendation, even in 2015. Developers continue to lament the bugginess of iCloud, and some have just given up entirely on supporting it, and no one’s found an alternative that might work, though some games do things like use Dropbox or iTunes file sharing to extract and save files. Plus, some people don’t want it, as I remember back in the days of Pocket Planes (Free) having iCloud issues. So I’m proud to report that Space Marshals‘ iCloud saving just works and never gave me any issues in normal usage. It’s optional when you launch the game for the first time, so if you’re not a fan, you have nothing to worry about. The one letdown to the game may be the length, which is somewhat short with 14 total missions. They’re not short in and of themselves, but the game does feel lke it ends suddenly. The game is promised to be episode one of multiple ones, and Pixelbite has done episodic content with Repulze ($0.99) before, so if anyone’s to be trusted to deliver on this promise, they’re a prime candidate. I think there’s actually a benefit here as well, in that it reinforces the loot system – by the end of the episode, I found myself wanting some better weapons. Well, there’s some 5-star weapons I had yet to earn because I didn’t complete them at that level. I am quite interested to see where future episodes go with this. It’s already a darn solid game as it is, but there’s plenty of loot to be added, new levels to be challenged by, and just more that can be done. 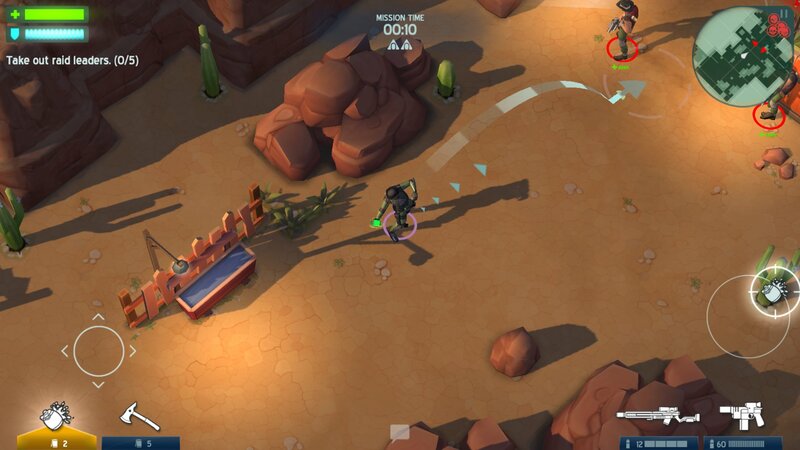 But until then, there’s plenty of fun to be had with Space Marshals.